Still a work in progress but meet one of my garden gnomes. I still need to print him a better case to mount the soil moisture pins better and make him more presentable in general. At his heart he is powered by one of my RFnodes so he is wireless and has an array of sensors that he reports on back to the network. 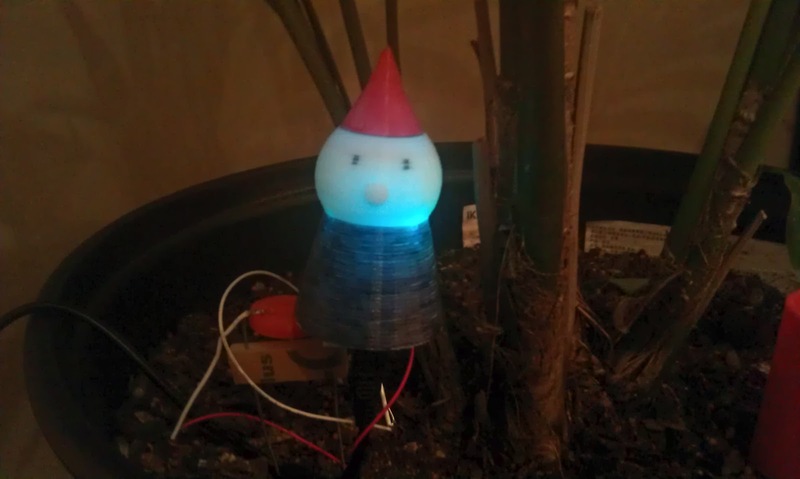 He currently reports back the light levels, soil moisture, temperature, humidity and having a RGB led that make him glow any color I can have him signal the plants status or as being network I can use the RGB led to make him (and his friends) signal anything the network want him to. I have some small PIR motion sensors I also want to mount as his nose and print a case that can house the bigger batteries required by the RGB led.